The distribution percentage for these main consumption allocations can vary from country to country, mainly because of the different climate conditions. 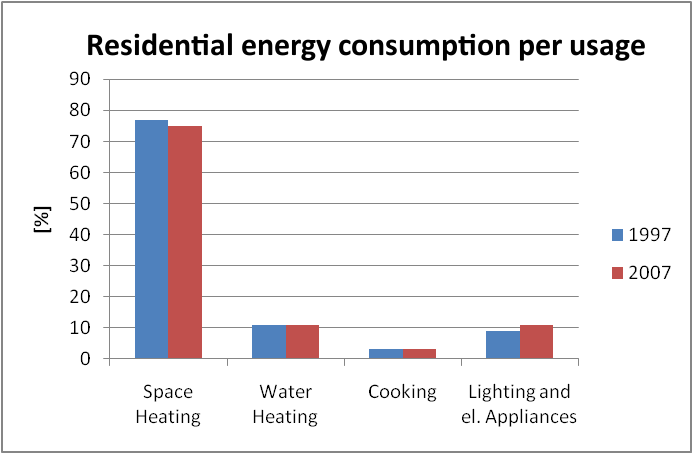 However, the total heating for dwelling spaces represents 75% of residential energy consumption, 11% is for water heating and a similar figure goes for lighting and appliances, 3% for cooking. This roughly means that 18% of European energy expense and air pollution come from what we literally burn for heating our houses. It should not surprise us if it is considered that, because of the rigid environmental winter conditions in Northern and Eastern Europe, heating systems work for most of the 24 hours in a day. 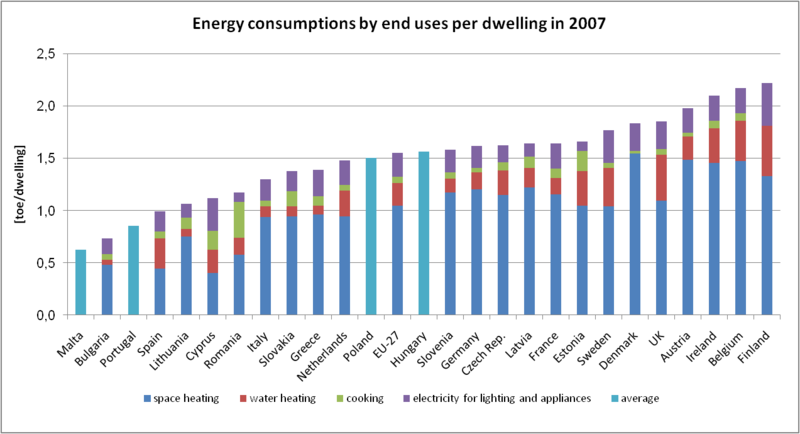 Besides, as the following graph shows, even in many Southern European countries the relative weight of energy consumption for residential heating is particularly preponderant. 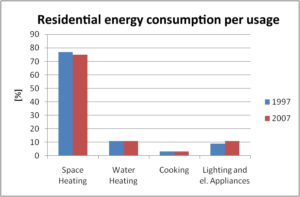 Finally, it must be considered that the residential heating sector is one where energy-saving actions could be highly effective, considering that nowadays this sector is still characterized by very high inefficiency and wastage (data reported comes from Odyssee – Energy Efficiency Indicators in Europe and further statistics from the European Environment Agency). Beyond any merely moral consideration, both these macro-effects of atmospheric pollutants caused by anthropic activities, have a considerable cost for states and the trend is confirmed to be increasing. The importance of emphasizing the causes of pollution is often underestimated or even completely ignored, because institutions, politicians and NGOs rarely know the qualitative and quantitative dimensions of the consequent effects (health and environment deterioration, state costs) or because it is not advantageous to face these topics for themselves. Despite this, some serious and important studies are available. 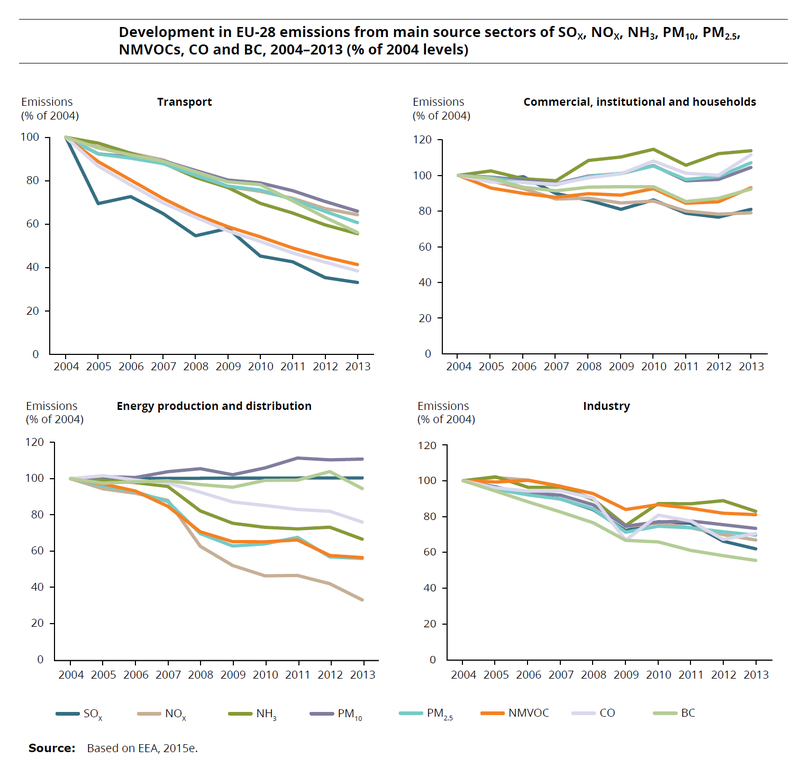 The World Health Organization (WHO) estimates that 2 million people die every year because of atmospheric pollution and that 50% of these deaths are geographically located in already developed countries that should have access, theoretically, to cleaner technologies (“WHO Air quality guidelines for particulate matter, ozone, nitrogen dioxide and sulfur dioxide – Global update 2005”). This study considers the concentration of PM10 as global index of air quality because it is well monitored in those cities. The health effects can also be related to other air pollutants produced by anthropic activities, and concentrations of which are correlated to those of PM10 (nitrogen mono and dioxide, sulphur dioxide, unburnt hydrocarbons, benzene, carbon monoxide, ozone, etc.). The thousand annual deaths and hospitalizations correlated to the atmospheric pollution in the WHO study could be greatly underestimated. As a comparison index, it should be considered that the annual deaths from car accidents in the same cities have been 488 in average. One of the major contribution to urban pollution is the heating and air-conditioning of indoor residential and working spaces. For instance, according to an Italian Piedmont Region IREA agency report, more than 25% of carbon dioxide, more than 17% of carbon monoxide, more than 1.5% of nitrogen oxides, more than 15% of PM10 and more than 10% of sulphur oxides in urban areas come from combustion, due to heating residential and working spaces on an annual average base. These percentages are a bit underestimated because, for conservative reasons, it has been excluded from this analysis of that report the not well classified cases of thermal energy recycling from different industrial processes, only excepting the explicitly declared cases of district heating. Besides, these percentages are averaged over 12 months, so that the pollutants relative weights because of heating indoor spaces are much higher during the winter season, becoming one of the major causes of pollution. Finally, according to a 2015 report from the European Environment Agency (EEA), estimates of the health impacts attributable to exposure to air pollution indicate that PM2.5 concentrations in 2012 were responsible for about 432,000 premature deaths originating from long‑term exposure in Europe (over 40 countries), of which around 403,000 were in the EU‑28. In the same year, the estimated impact of exposure to NO2 (long-term exposure) and O3 (short-term exposure) concentrations on the population in the same 40 European countries was around 75,000 and 17,000 premature deaths, respectively, and around 72,000 and 16,000 premature deaths, respectively, in the EU‑28. Air pollution continues to damage vegetation and ecosystems. It has several important environmental impacts, which affect vegetation directly, as well as the quality of water and soil and the ecosystem services they support. The most harmful air pollutants in terms of damage to ecosystems are O3, ammonia (NH3) and NOx. Europe’s sustained ground-level O3 concentrations damage agricultural crops, forests and plants by reducing their growth rates. The EU target value for protection of vegetation from O3 has been exceeded in about 27% of the agricultural land area in the EU-28 in 2012, mostly in Southern and Central Europe. The long‑term objective for the protection of vegetation from O3 was exceeded in 86% of the total agricultural area in the EU-28, and the United Nations Economic Commission for Europe (UNECE) Convention on Long-range Transboundary Air Pollution (LRTAP) critical level for the protection of forests was exceeded in 67% of the total EU‑28 forested area in 2012. NOx, SO2 and NH3 contribute to the acidification of soil, lakes and rivers, causing the loss of animal and plant life and biodiversity. Improvements in reducing ecosystem exposure to excess levels of acidification have been made in past decades, largely as a result of declining SO2 emissions. An estimated 7% of the total EU‑28 ecosystem area and 5% of the Natura 2000 area was at risk of acidification in 2010. 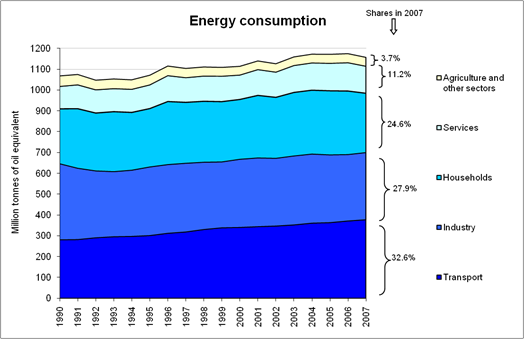 This represents a reduction of 30% and 40%, respectively, from 2005 levels. Apart from causing acidification, NH3 and NOx emissions also disrupt land and water ecosystems by introducing excessive amounts of nutrient nitrogen. This leads to eutrophication, an oversupply of nutrients that can lead to changes in species diversity and to invasions of new species. It is estimated that around 63% of European ecosystem areas, and 73% of the area covered by Natura 2000-protected sites, remained exposed to air-pollution levels exceeding eutrophication limits in 2010. Finally, the same report points out that the main causes of air pollution are transport, industry, power plants, agriculture, households and waste management. More particularly, anthropogenic sources, which are predominant in urban areas, include fuel combustion in thermal power generation, incineration, domestic heating for households and fuel combustion for vehicles, as well as vehicle (tyre and brake) and road wear and other types of anthropogenic dust. Similarly, the main anthropogenic emissions of SO2 derive from domestic heating, stationary power generation and transport. Statistics highlight that while, for transportation and industry some energy efficiency actions have led to meaningful results, the same cannot be said for commercial, institutional and household sources of consumption. Heating waste is also a reason for families impoverishment, if it could be avoided without decreasing the occupants thermal comfort. Health, environment and families waste are the reasons the European Union finally promulgated a directive that requires heating conversion systems to be installed. The advantages are clear: for the residents to save money, for Europe to be less dependent on oil and gas producing countries, for people to live in a healthier environment. The European obligation deadline is 31st December 2016. These systems are needed to convert the old, centralized heating plants generally used in buildings that have been built up to the ‘70s/’80s, which cannot have independent indoor temperature controls and where it is not possible for residents to pay on the basis of their actual thermal consumption. It is a huge market, approximately 350 million radiators to be converted worldwide (mainly in Europe and Russia) and an extraordinary opportunity to invent new Internet of Things systems to increase the accuracy of allocating the costs (at present very low, with 10% to 40% errors in heat cost allocators, the only existing technology) and the savings from heating (very low, from 6% to 12% with thermostatic valves). EcoThermo is an innovative system which allows greater accuracy (from 3% to 6% in average), high heating savings (20% to 35%), complete remote control for residents and heating contractors. These innovations have been patented and validated by two external public research bodies but they need investment for industrialization. The reference market is equal to 60 billion euros for selling and 2 billion euros/year for the allocation service.